Shimla: Recently some information has come that the district administration of Shimla is thinking to implement the same odd-even formula, which is applied in Delhi to solve the problem of uncontrollable traffic and air pollution. 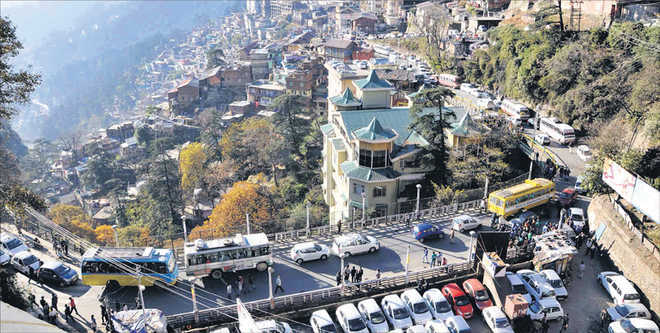 Shimla is also a big city and along with the rise in number of vehicles, including the both of residents and visitors, traffic jams are also increasing in the city. Theses annoying and delaying traffic jams are always at their peak during the tourist season and sometimes even goes uncontrollable for the traffic police to control. Therefore, to resolve this problem and control the increasing traffic, the additional district magistrate, GC Negi called a special meeting on Saturday which included ministers from different departments. GC Negi has informed that the idea of adopting the odd-even formula in Shimla was also discussed. Moreover, along with the odd-even formula, the plans of generating one-way traffic and dealing with the congestion created by the foreign buses was also discussed. Himachal’s Chief Minister Virbhadra Singh has said that as there was no scope of Shimla’s development, the government was thinking of developing the tourist spots so that the guests and visitors could be attracted to these spots and the pressure of traffic on the existing towns can be decreased. Moreover, the information also says that the odd-even formula and other suggestions discussed in the meeting will be placed before the state government so that they can be properly implemented. The odd-even formula has somehow helped the people of Delhi a lot but still many people criticise it. Even during the time of emergencies, one cannot use his odd numbered car on the day of even and vice-versa, this issue has become the biggest problem of this formula but for Shimla, let us hope that it will help the government in reducing the pollution and the traffic.